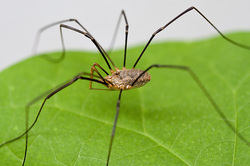 Spiders have eight legs, two body regions, and no wings or antennas. 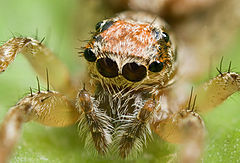 They have three or four pair of eyes. 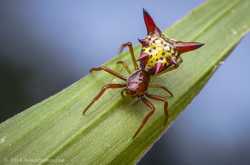 The lifestyle can vary between spiders. 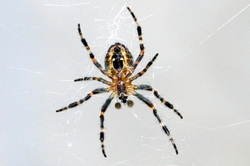 Some spiders like to live in damp conditions such as basements, and crawl spaces. Other spiders prefer to live in dry, warm areas such as air vents, upper corners of rooms and attics and hide in dark areas. 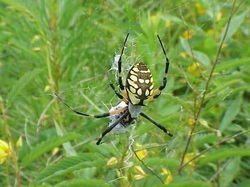 Spiders feed on insects, other spiders, and any other prey they can subdue. Spiders produce silk that is elastic and strong. 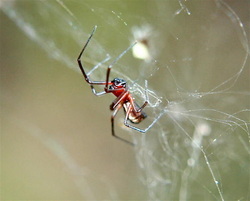 Their silk is used to spin webs where they can live and keep their egg sacs. Each web's size and shape is varied according to the spider. Some webs are orb-shaped, while others are funnel-shaped, orderly, haphazard, etc. 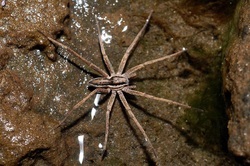 Some spider species live in burrows instead of webs, while others live in crevices. Almost all spiders are venomous, but the black widow, brown recluse, hobo, and yellow sac spiders are the most venomous spiders in the United States. 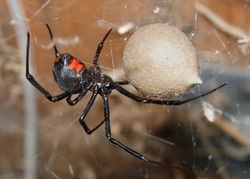 Black Widow Spiders: Characterized by the hourglass marking on its belly. The bite feels like a pinprick. Signs and symptoms of the bite can include: swelling, faint red marks, intense pain and stiffness, severe abdominal pain or cramping, excessive sweating. 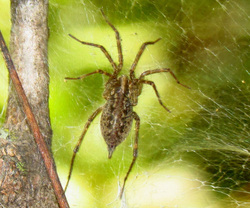 Hobo Spiders: Even though the bite of a Hobo Spider is initially painless, it can be serious. A redness will first appear around the bite site, which will develop into a blister after 24 hours, before breaking open, leaving an open, oozing ulceration. The bite might also cause severe headaches lasting 2 to 7 days and even nausea, weakness, fatigue, malaise, temporary memory loss and vision impairment. 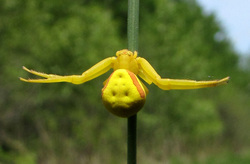 Yellow Sac Spiders: This species has a mildly toxic venom. Bites can be painful and cause skin irritations: erythema, edema and pruritis. Yet, though wounds may become slightly necrotic, they usually heal in rather rapidly without severe scarring. There are two primary ways spiders can enter the home: open, poorly screened windows and doors and through cracks around door and window frames. Another common method of entry is by coming inside through boxes, an outdoor item, and other materials that are brought inside. 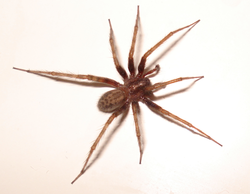 If you find spiders in your home, contact your pest management professional. They will be able to conduct an inspection and create a control plan to best eliminate the issue. Contact your pest management professional to conduct an inspection to create a control plan. 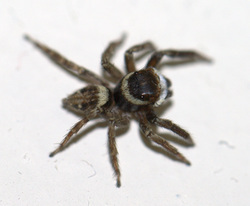 However, if you have a high amount of spiders in your home, it is best to contact your pest control professionals, especially if the spider infestation that you are dealing with could be poisonous. 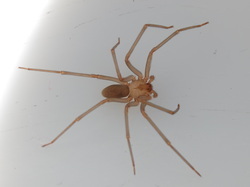 Spiders found in and around Richmond, VA.
Click here to learn about Brown Recluse Spiders!